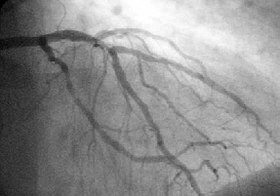 A coronary angiogram showing the circulation in the left main coronary artery and its branches. Percutaneous coronary intervention (PCI) is a non-surgical procedure used to treat narrowing (stenosis) of the coronary arteries of the heart found in coronary artery disease. After accessing the blood stream through the femoral or radial artery, the procedure uses coronary catheterization to visualise the blood vessels on X-ray imaging. After this, an interventional cardiologist can perform a coronary angioplasty, using a balloon catheter in which a deflated balloon is advanced into the obstructed artery and inflated to relieve the narrowing; certain devices such as stents can be deployed to keep the blood vessel open. Various other procedures can also be performed. Primary PCI is the urgent use of PCI in people with acute myocardial infarction (heart attack), especially where there is evidence of heart damage on the electrocardiogram (ST elevation MI). PCI is also used in people after other forms of myocardial infarction or unstable angina where there is a high risk of further events. Finally, PCI may be used in people with stable angina pectoris, particularly if the symptoms are difficult to control with medication. PCI is an alternative to coronary artery bypass grafting (CABG, often referred to as "bypass surgery"), which bypasses stenotic arteries by grafting vessels from elsewhere in the body. Under certain circumstances (extensive blockages, background of diabetes), CABG may be superior. Coronary angioplasty was first introduced in 1977 by Andreas Gruentzig in Switzerland. PCI is used primarily to open a blocked coronary artery and restore arterial blood flow to heart tissue, without requiring open-heart surgery. In patients with a restricted or blocked coronary artery, PCI may be the best option to re-establish blood flow as well as prevent angina (chest pain), myocardial infarctions (heart attacks) and death. Today, PCI usually includes the insertion of stents, such as bare-metal stents, drug-eluting stents, and fully resorbable vascular scaffolds (or naturally dissolving stents). The use of stents has been shown to be important during the first three months after PCI; after that the artery can remain open on its own. This is the premise for developing bioresorbable stents that naturally dissolve after they are no longer needed. The appropriateness of PCI use depends on many factors. PCI may be appropriate for patients with stable coronary artery disease if they meet certain criteria, such as having any coronary stenosis greater than 50 percent or having angina symptoms that are unresponsive to medical therapy. Although PCI may not provide any greater help in preventing death or myocardial infarction over oral medication for patients with stable coronary artery disease, it likely provides better relief of angina. In patients with acute coronary syndromes, PCI may be appropriate; guidelines and best practices are constantly evolving. In patients with severe blockages, such as ST-segment elevation myocardial infarction (STEMI), PCI can be critical to survival as it reduces deaths, myocardial infarctions and angina compared with medication. For patients with either non-ST-segment elevation myocardial infarction (nSTEMI) or unstable angina, treatment with medication and/or PCI depends on a patient's risk assessment. The door-to-balloon time is used as a quality measure for hospitals to determine the timeliness of primary PCI. The use of PCI in addition to anti-angina medication in stable angina may reduce the number of patients with angina attacks for up to 3 years following the therapy, but does not reduce the risk of death, future myocardial infarction or need for other interventions. Coronary angioplasty is widely practiced and has a number of risks; however, major procedural complications are uncommon. Coronary angioplasty is usually performed using invasive catheter-based procedures by an interventional cardiologist, a medical doctor with special training in the treatment of the heart. The patient is usually awake during angioplasty, and chest discomfort may be experienced during the procedure. The patient remains awake in order to monitor the patient's symptoms. If symptoms indicate the procedure is causing ischemia the cardiologist may alter or abort part of the procedure. Bleeding from the insertion point in the groin (femoral artery) or wrist (radial artery) is common, in part due to the use of antiplatelet drugs. Some bruising is therefore to be expected, but occasionally a hematoma may form. This may delay hospital discharge as flow from the artery into the hematoma may continue (pseudoaneurysm) which requires surgical repair. Infection at the skin puncture site is rare and dissection (tearing) of the access blood vessel is uncommon. Allergic reaction to the contrast dye used is possible, but has been reduced with the newer agents. Deterioration of kidney function can occur in patients with pre-existing kidney disease, but kidney failure requiring dialysis is rare. Vascular access complications are less common and less serious when the procedure is performed via the radial artery. The most serious risks are death, stroke, ventricular fibrillation (non-sustained ventricular tachycardia is common), myocardial infarction (heart attack, MI), and aortic dissection. A heart attack during or shortly after the procedure occurs in 0.3% of cases; this may require emergency coronary artery bypass surgery. Heart muscle injury characterized by elevated levels of CK-MB, troponin I, and troponin T may occur in up to 30% of all PCI procedures. Elevated enzymes have been associated with later clinical outcomes such as higher risk of death, subsequent MI, and need for repeat revascularization procedures. Angioplasty carried out shortly after an MI has a risk of causing a stroke, but this is less than the risk of a stroke following thrombolytic drug therapy. The term balloon angioplasty is commonly used to describe percutaneous coronary intervention, which describes the inflation of a balloon within the coronary artery to crush the plaque into the walls of the artery. While balloon angioplasty is still done as a part of nearly all percutaneous coronary interventions, it is rarely the only procedure performed. The angioplasty procedure usually consists of most of the following steps and is performed by a team made up of physicians, physician assistants, nurse practitioners, nurses, radiographers, and endovascular specialists; all of whom have extensive and specialized training in these types of procedures. Access into the femoral artery in the leg (or, less commonly, into the radial artery or brachial artery in the arm) is created by a device called an "introducer needle". This procedure is often termed percutaneous access. Once access into the artery is gained, a "sheath introducer" is placed in the opening to keep the artery open and control bleeding. Through this sheath, a long, flexible, soft plastic tube called a "guiding catheter" is pushed. The tip of the guiding catheter is placed at the mouth of the coronary artery. The guiding catheter also allows for radio-opaque dyes (usually iodine-based) to be injected into the coronary artery, so that the disease state and location can be readily assessed using real time X-ray visualization. During the X-ray visualization, the cardiologist estimates the size of the coronary artery and selects the type of balloon catheter and coronary guidewire that will be used during the case. Heparin (a "blood thinner" or medicine used to prevent the formation of clots) is given to maintain blood flow. Bivalirudin when used instead of heparin has a higher rate of myocardial infarction but lower rates of bleeding. The coronary guidewire, which is an extremely thin wire with a radio-opaque flexible tip, is inserted through the guiding catheter and into the coronary artery. While visualizing again by real-time X-ray imaging, the cardiologist guides the wire through the coronary artery to the site of the stenosis or blockage. The tip of the wire is then passed across the blockage. The cardiologist controls the movement and direction of the guidewire by gently manipulating the end that sits outside the patient through twisting of the guidewire. While the guidewire is in place, it now acts as the pathway to the stenosis. The tip of the angioplasty or balloon catheter is hollow and is then inserted at the back of the guidewire—thus the guidewire is now inside of the angioplasty catheter. The angioplasty catheter is gently pushed forward, until the deflated balloon is inside of the blockage. The balloon is then inflated, and it compresses the atheromatous plaque and stretches the artery wall to expand. If a stent was on the balloon, then it will be implanted (left behind) to support the new stretched open position of the artery from the inside. A coronary stent placed by percutaneous coronary intervention. Traditional bare-metal stents (BMS) provide a mechanical framework that holds the artery wall open, preventing stenosis, or narrowing, of coronary arteries. Newer drug-eluting stents (DES) are traditional stents with a polymer coating containing drugs that prevent cell proliferation. The antiproliferative drugs are released slowly over time to help prevent tissue growth — which may come in response to the stent — that can block the artery. These types of stents have been shown to help prevent restenosis of the artery through physiological mechanisms that rely upon the suppression of tissue growth at the stent site and local modulation of the body’s inflammatory and immune responses. The first two drug-eluting stents to be utilized were the paclitaxel-eluting stent and the sirolimus-eluting stent, both of which have received approval from the U.S. Food and Drug Administration. Most current FDA-approved drug-eluting stents use sirolimus (also known as rapamycin), everolimus and zotarolimus. Biolimus A9-eluting stents, which utilize biodegradable polymers, are approved outside the U.S. However, in 2006, clinical trials showed a possible connection between drug-eluting stents and an event known as “late stent thrombosis” where the blood clotting inside the stent can occur one or more years after stent implantation. Late stent thrombosis occurs in 0.9% of patients and is fatal in about one-third of cases when the thrombosis occurs. Increased attention to antiplatelet medication duration and new generation stents (such as everolimus-eluting stents) have dramatically reduced concerns about late stent thrombosis. Newer-generation PCI technologies aim to reduce the risk of late stent thrombosis or other long-term adverse events. Some DES products market a biodegradable polymer coating with the belief that the permanent polymer coatings of DES contribute to long-term inflammation. Other strategies: A more recent study proposes that, in the case of population with diabetes mellitus—a population particularly at risk—a treatment with paclitaxel-eluting balloon followed by BMS may reduce the incidence of coronary restenosis or myocardial infarction compared with BMS administered alone. After placement of a stent or scaffold, the patient needs to take two antiplatelet medications (aspirin and one of a few other options) for several months to help prevent blood clots. The ideal length of time a patient needs to be on dual antiplatelet therapy is not fully determined, but guidelines recommend continuing for 12 months beyond placement unless a patient is at a high risk for bleeding. In primary PCI, angiography may demonstrate thrombus (blood clots) inside the coronary arteries. Various studies have been performed to determine whether aspirating these clots (thrombus aspiration or manual thrombectomy) is beneficial. At the moment there is no evidence that routine clot aspiration improves outcomes. Percutaneous coronary angioplasty is one of the most common procedures performed during U.S. hospital stays; it accounted for 3.6% of all operating room procedures performed in 2011. Between 2001 and 2011, however, its volume decreased by 28%, from 773,900 operating procedures performed in 2001 to 560,500 procedures in 2011. Most studies have found that CABG offers advantages in reducing death and myocardial infarction in people with multivessel blockages compared with PCI. Different modeling studies have come to opposing conclusions on the relative cost-effectiveness of PCI and CABG in people with myocardial ischemia that does not improve with medical treatment. Coronary angioplasty, also known as percutaneous transluminal coronary angioplasty (PTCA), because it is done through the skin and through the lumen of the artery, was first developed in 1977 by Andreas Gruentzig. The first procedure took place Friday Sept 16, 1977, at Zurich, Switzerland. Adoption of the procedure accelerated subsequent to Gruentzig's move to Emory University in the United States. Gruentzig's first fellow at Emory was Merril Knudtson, who, by 1981, had already introduced it to Calgary, Alberta, Canada. By the mid-1980s, many leading medical centers throughout the world were adopting the procedure as a treatment for coronary artery disease. Angioplasty is sometimes erroneously referred to as "Dottering", after Interventional Radiologist, Dr Charles Theodore Dotter, who, together with Dr Melvin P. Judkins, first described angioplasty in 1964. As the range of procedures performed upon coronary artery lumens has widened, the name of the procedure has changed to percutaneous coronary intervention. Current concepts recognize that after three months the artery has adapted and healed and no longer needs the stent. Complete revasculariztion of all stenosed coronary arteries after a STEMI is more efficacious in terms of major adverse cardiac events and all-cause mortality, while being safer than culprit-vessel-only approach. In 2007 the New England Journal of Medicine published the results of a trial called COURAGE. The study compared stenting as used in PCI to medical therapy alone in symptomatic stable coronary artery disease (CAD). This showed there was no mortality advantage to stenting in stable CAD, though there was earlier relief of symptoms which equalized by five years. After this trial there were widely publicized reports of individual doctors performing PCI in patients who did not meet any traditional criteria. A 2014 meta-analysis showed there may be improved mortality with second generation drug-eluting stents, which were not available during the COURAGE trial. Medical societies have since issued guidelines as to when it is appropriate to perform percutaneous coronary intervention. In response the rate of inappropriate stenting was seen to have declined between 2009 and 2014. Statistics published related to the trends in U.S. hospital procedures, showed a 28% decrease in the overall number of PCIs performed in the period from 2001 to 2011, with the largest decrease notable from 2007. One study found that symptom relief in people with stable angina after percutaneous coronary intervention is similar to placebo. ^ George A Stouffer, III, MD (21 November 2016). "Percutaneous Coronary Intervention (PCI): Practice Essentials, Background, Indications". Medscape. Retrieved 22 January 2017. ^ Head, SJ; Milojevic, M; Daemen, J; Ahn, JM; Boersma, E; Christiansen, EH; Domanski, MJ; Farkouh, ME; Flather, M; Fuster, V; Hlatky, MA; Holm, NR; Hueb, WA; Kamalesh, M; Kim, YH; Mäkikallio, T; Mohr, FW; Papageorgiou, G; Park, SJ; Rodriguez, AE; Sabik JF, 3rd; Stables, RH; Stone, GW; Serruys, PW; Kappetein, AP (10 March 2018). "Mortality after coronary artery bypass grafting versus percutaneous coronary intervention with stenting for coronary artery disease: a pooled analysis of individual patient data". Lancet. 391 (10124): 939–948. doi:10.1016/S0140-6736(18)30423-9. PMID 29478841. ^ a b Oberhauser JP, Hossainy S, Rapoza RJ (2009). "Design principles and performance of bioresorbable polymeric vascular scaffolds". EuroIntervention. 5 (Suppl F): F15–22. doi:10.4244/EIJV5IFA3. PMID 22100671. ^ Pursnani S, Korley F, Gopaul R, et al. (2012). "Percutaneous coronary intervention versus optimal medical therapy in stable coronary artery disease: a systematic review and meta-analysis of randomized clinical trials". Circ Cardiovasc Interv. 5 (4): 476–490. doi:10.1161/CIRCINTERVENTIONS.112.970954. PMID 22872053. ^ Fihn S, Gardin J, Abrams J, et al. (2012). "2012 ACCF/AHA/ACP/AATS/PCNA/SCAI/STS guideline for the diagnosis and management of patients with stable ischemic heart disease: executive summary: a report of the American College of Cardiology Foundation/American Heart Association Task Force on Practice Guidelines, and the American College of Physicians, American Association for Thoracic Surgery, Preventive Cardiovascular Nurses Association, Society for Cardiovascular Angiography and Interventions, and Society of Thoracic Surgeons". J Am Coll Cardiol. 60 (24): 2564–2603. doi:10.1016/j.jacc.2012.07.012. PMID 23182124. ^ O'Gara PT, Kushner FG, Ascheim DD, et al. (2013). "2013 ACCF/AHA guideline for the management of ST-elevation myocardial infarction: a report of the American College of Cardiology Foundation/American Heart Association Task Force on Practice Guidelines". Circulation. 127 (4): e362–425. doi:10.1161/CIR.0b013e3182742cf6. PMID 23247304. ^ a b Amsterdam EA, Wenger NK, Brindis RG, et al. (2014). "2014 AHA/ACC Guideline for the Management of Patients With Non-ST-Elevation Acute Coronary Syndromes: A Report of the American College of Cardiology/American Heart Association Task Force on Practice Guidelines". J Am Coll Cardiol. 64 (24): e139–228. doi:10.1016/j.jacc.2014.09.017. PMID 25260718. ^ Gorenoi, V; Hagen, A (May 2014). "[Percutaneous coronary intervention in addition to optimal medical therapy for stabile coronary artery disease - a systematic review and meta-analysis]". Deutsche Medizinische Wochenschrift. 139 (20): 1039–45. doi:10.1055/s-0034-1369879. PMID 24801298. ^ Pursnani, S.; Korley, F.; Gopaul, R.; Kanade, P.; Chandra, N.; Shaw, R. E.; Bangalore, S. (7 August 2012). "Percutaneous Coronary Intervention Versus Optimal Medical Therapy in Stable Coronary Artery Disease: A Systematic Review and Meta-Analysis of Randomized Clinical Trials". Circulation: Cardiovascular Interventions. 5 (4): 476–490. doi:10.1161/CIRCINTERVENTIONS.112.970954. PMID 22872053. ^ Harold JG; Bass TA; Bashore TM; et al. (May 2013). "ACCF/AHA/SCAI 2013 Update of the Clinical Competence Statement on Coronary Artery Interventional Procedures: A Report of the American College of Cardiology Foundation/American Heart Association/American College of Physicians Task Force on Clinical Competence and Training (Writing Committee to Revise the 2007 Clinical Competence Statement on Cardiac Interventional Procedures)". Circulation. 128 (4): 436–72. doi:10.1161/CIR.0b013e318299cd8a. PMID 23658439. ^ Jang JS; Jin HY; Seo JS; et al. (August 2012). "The transradial versus the transfemoral approach for primary percutaneous coronary intervention in patients with acute myocardial infarction: a systematic review and meta-analysis". EuroIntervention. 8 (4): 501–10. doi:10.4244/EIJV8I4A78. PMID 22581470. ^ Yang EH, Gumina RJ, Lennon RJ, Holmes DR, Rihal CS, Singh M (2005). "Emergency coronary artery bypass surgery for percutaneous coronary interventions: changes in the incidence, clinical characteristics, and indications from 1979 to 2003". Journal of the American College of Cardiology. 46 (11): 2004–2009. doi:10.1016/j.jacc.2005.06.083. PMID 16325032. ^ Califf RM; Abdelmeguid AE; et al. (1998). "Myonecrosis after revascularization procedures". J Am Coll Cardiol. 31 (2): 241–51. doi:10.1016/S0735-1097(97)00506-8. PMID 9462562. ^ Tardiff BW; Califf R. M.; et al. (1999). "Clinical outcomes after detection of elevated cardiac enzymes in patients undergoing percutaneous intervention. IMPACT-II Investigators. Integrilin (eptifibatide) to Minimize Platelet Aggregation and Coronary Thrombosis-II". J Am Coll Cardiol. 33 (1): 88–96. doi:10.1016/S0735-1097(98)00551-8. PMID 9935014. ^ Cucherat M, Bonnefoy E, Tremeau G (2003). "Primary angioplasty versus intravenous thrombolysis for acute myocardial infarction". Cochrane Database Syst Rev (3): CD001560. doi:10.1002/14651858.CD001560. PMID 12917910. ^ Movahed MR, Hashemzadeh M, Jamal MM, Ramaraj R (2010). "Decreasing in-hospital mortality of patients undergoing percutaneous coronary intervention with persistent higher mortality rates in women and minorities in the United States". J Invasive Cardiol. 22 (2): 58–60. PMID 20124588. ^ "What Is Coronary Angioplasty?". National Health, Lung and Blood Institute. Retrieved 2012-11-08. ^ Cavender, MA; Sabatine, MS (Aug 16, 2014). "Bivalirudin versus heparin in patients planned for percutaneous coronary intervention: a meta-analysis of randomised controlled trials". Lancet. 384 (9943): 599–606. doi:10.1016/s0140-6736(14)61216-2. PMID 25131979. ^ Abdulla, Dr. Abdulla M.. "Angioplasty". www.heartsite.com. Retrieved 3 April 2018. ^ Claessen BE, Henriques JP, Dangas GD (2010). "Clinical studies with sirolimus, zotarolimus, everolimus, and biolimus A9 drug-eluting stent systems". Curr Pharm Des. 16 (36): 4012–24. doi:10.2174/138161210794454941. PMID 21208185. ^ Mauri L, Hsieh WH, Massaro JM, Ho KK, D'Agostino R, Cutlip DE (2007). "Stent thrombosis in randomized clinical trials of drug-eluting stents". N Engl J Med. 356 (10): 1020–1029. doi:10.1056/NEJMoa067731. PMID 17296821. ^ Palmerini T, Benedetto U, Biondi-Zoccai G, et al. (2015). "Long-Term Safety of Drug-Eluting and Bare-Metal Stents: Evidence From a Comprehensive Network Meta-Analysis". J Am Coll Cardiol. 65 (23): 2496–2507. doi:10.1016/j.jacc.2015.04.017. PMID 26065988. ^ Mieres J, Fernandez-Pereira C, Risau G, et al. (2012). "One-year outcome of patients with diabetes mellitus after percutaneous coronary intervention with three different revascularization strategies: results from the Diabetic Argentina Registry (DEAR)". Cardiovasc Revasc Med. 13 (5): 265–271. doi:10.1016/j.carrev.2012.06.001. PMID 22796496. ^ Levine GN, Bates ER, Blankenship JC, et al. (2011). "2011 ACCF/AHA/SCAI guideline for percutaneous coronary intervention: a report of the American College of Cardiology Foundation/American Heart Association Task Force on Practice Guidelines and the Society for Cardiovascular Angiography and Interventions". Circulation. 124 (23): e574–e651. doi:10.1161/CIR.0b013e31823ba622. PMID 22064601. ^ Jolly, Sanjit S.; James, Stefan; Džavík, Vladimír; Cairns, John A.; Mahmoud, Karim D.; Zijlstra, Felix; Yusuf, Salim; Olivecrona, Goran K.; Renlund, Henrik; Gao, Peggy; Lagerqvist, Bo; Alazzoni, Ashraf; Kedev, Sasko; Stankovic, Goran; Meeks, Brandi; Frøbert, Ole (10 January 2017). "Thrombus Aspiration in ST-Segment–Elevation Myocardial InfarctionClinical Perspective". Circulation. 135 (2): 143–152. doi:10.1161/CIRCULATIONAHA.116.025371. PMID 27941066. ^ Weiss AJ, Elixhauser A, Andrews RM (February 2014). "Characteristics of Operating Room Procedures in U.S. Hospitals, 2011". HCUP Statistical Brief #170. Rockville, MD: Agency for Healthcare Research and Quality. ^ a b Weiss AJ, Elixhauser A (March 2014). "Trends in Operating Room Procedures in U.S. Hospitals, 2001—2011". HCUP Statistical Brief #171. Rockville, MD: Agency for Healthcare Research and Quality. ^ Sipahi I, Akay MH, Dagdelen S, Blitz A, Alhan C (2014). "Coronary artery bypass grafting vs percutaneous coronary intervention and long-term mortality and morbidity in multivessel disease: meta-analysis of randomized clinical trials of the arterial grafting and stenting era". JAMA Intern Med. 174 (2): 223–230. doi:10.1001/jamainternmed.2013.12844. PMID 24296767. ^ Stroupe KT, Morrison DA, Hlatky MA, Barnett PG, Cao L, Lyttle C, Hynes DM, Henderson WG (September 2006). "Cost-effectiveness of coronary artery bypass grafts versus percutaneous coronary intervention for revascularization of high-risk patients". Circulation. 114 (12): 1251–1257. doi:10.1161/CIRCULATIONAHA.105.570838. PMID 16966588. ^ Osnabrugge RL, Magnuson EA, Serruys PW, Campos CM, Wang K, van Klaveren D, Farooq V, Abdallah MS, Li H, Vilain KA, Steyerberg EW, Morice MC, Dawkins KD, Mohr FW, Kappetein AP, Cohen DJ (2015). "Cost-effectiveness of percutaneous coronary intervention versus bypass surgery from a Dutch perspective". Heart. 101 (24): 1980–8. doi:10.1136/heartjnl-2015-307578. PMID 26552756. ^ Zhang Z, Kolm P, Grau-Sepulveda MV, Ponirakis A, O'Brien SM, Klein LW, Shaw RE, McKay C, Shahian DM, Grover FL, Mayer JE, Garratt KN, Hlatky M, Edwards FH, Weintraub WS (2015). "Cost-effectiveness of revascularization strategies: the ASCERT study". J. Am. Coll. Cardiol. 65 (1): 1–11. doi:10.1016/j.jacc.2014.09.078. PMC 5697906. PMID 25572503. ^ Meier B, Bachmann D, Lüscher T (February 2003). "25 years of coronary angioplasty: almost a fairy tale". Lancet. 361 (9356): 527. doi:10.1016/S0140-6736(03)12470-1. PMID 12583964. ^ "Foothills Interventional Cardiology Service". Archived from the original on 2008-08-27. Retrieved 2008-12-31. ^ Dotter CT, Judkins MP (November 1964). "Transluminal treatment of arteriosclerotic obstruction". Circulation. 30 (5): 654–70. doi:10.1161/01.CIR.30.5.654. PMID 14226164. ^ Nguyen, An Vu; Thanh, Le Van; Kamel, Mohamed Gomaa; Abdelrahman, Sara Attia Mahmoud; EL-Mekawy, Mohamed; Mokhtar, Mohamed Ashraf; Ali, Aya Ashraf; Hoang, Nam Nguyen Nho; Vuong, Nguyen Lam (2017-06-11). "Optimal percutaneous coronary intervention in patients with ST-elevation myocardial infarction and multivessel disease: An updated, large-scale systematic review and meta-analysis". International Journal of Cardiology. 0: 67–76. doi:10.1016/j.ijcard.2017.06.027. ISSN 0167-5273. PMID 28647440. ^ a b Boden, W. E.; O'Rourke, R. A.; Teo, K. K.; Hartigan, P. M.; Maron, D. J.; Kostuk, W. J.; Knudtson, M.; Dada, M.; Casperson, P.; Harris, C. L.; Chaitman, B. R.; Shaw, L.; Gosselin, G.; Nawaz, S.; Title, L. M.; Gau, G.; Blaustein, A. S.; Booth, D. C.; Bates, E. R.; Spertus, J. A.; Berman, D. S.; Mancini, G. B. J.; Weintraub, W. S.; Courage Trial Research, G. (2007). "Optimal Medical Therapy with or without PCI for Stable Coronary Disease". New England Journal of Medicine. 356 (15): 1503–1516. doi:10.1056/NEJMoa070829. PMID 17387127. ^ "Dr. Mark Midei Found Liable Of Breaching Standard Care". cbslocal.com. 23 October 2013. Retrieved 3 April 2018. ^ Windecker, S.; Stortecky, S.; Stefanini, G. G.; daCosta, B. R.; Rutjes, A. W.; Di Nisio, M.; Siletta, M. G.; Maione, A.; Alfonso, F.; Clemmensen, P. M.; Collet, J.-P.; Cremer, J.; Falk, V.; Filippatos, G.; Hamm, C.; Head, S.; Kappetein, A. P.; Kastrati, A.; Knuuti, J.; Landmesser, U.; Laufer, G.; Neumann, F.-J. ; Richter, D.; Schauerte, P.; Sousa Uva, M.; Taggart, D. P.; Torracca, L.; Valgimigli, M.; Wijns, W.; Witkowski, A.; Kolh, P.; Juni, P. (2014). "Revascularisation versus medical treatment in patients with stable coronary artery disease: network meta-analysis". BMJ. 348 (jun23 8): g3859. doi:10.1136/bmj.g3859. ISSN 1756-1833. PMID 24958153. ^ American College of Cardiology. "Five Things Physicians and Patients Should Question" (PDF). Choosing Wisely: an initiative of the ABIM Foundation. American College of Cardiology. Archived from the original (PDF) on June 24, 2012. Retrieved August 17, 2012. ^ Patel, M. R.; Dehmer, G. J.; Hirshfeld, J. W.; Smith, P. K.; Spertus, J. A. (2009). "ACCF/SCAI/STS/AATS/AHA/ASNC 2009 Appropriateness Criteria for Coronary Revascularization". Journal of the American College of Cardiology. 53 (6): 530–553. doi:10.1016/j.jacc.2008.10.005. PMID 19195618. ^ Desai, Nihar R.; Bradley, Steven M.; Parzynski, Craig S.; Nallamothu, Brahmajee K.; Chan, Paul S.; Spertus, John A.; Patel, Manesh R.; Ader, Jeremy; Soufer, Aaron; Krumholz, Harlan M.; Curtis, Jeptha P. (2015). "Appropriate Use Criteria for Coronary Revascularization and Trends in Utilization, Patient Selection, and Appropriateness of Percutaneous Coronary Intervention". JAMA. 314 (19): 2045. doi:10.1001/jama.2015.13764. ISSN 0098-7484. PMC 5459470. PMID 26551163. ^ Al-Lamee R, Thompson D, Dehbi HM, Sen S, Tang K, Davies J, et al. (January 2018). "Percutaneous coronary intervention in stable angina (ORBITA): a double-blind, randomised controlled trial". Lancet. 391 (10115): 31–40. doi:10.1016/S0140-6736(17)32714-9. PMID 29103656.